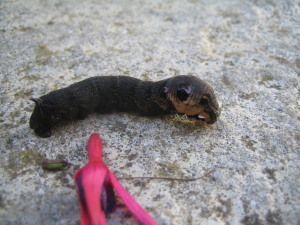 Observation - Elephant Hawk Moth? - UK and Ireland. Description: A sort of cross between a caterpillar, a snake and a sausage dog! Had a spike on its tail and legs under its head. A sort of cross between a caterpillar, a snake and a sausage dog! Had a spike on its tail and legs under its head.